Dr. Robert B. Hayling - "Father of the Civil Rights Act of 1964"
Dr. Hayling was born in Tallahassee, Florida on November 20, 1929. He was the son of a college professor with over thirty-three years of service on the faculty of Florida A & M University. He is the second of four children, all of whom have Graduate Degrees and three of which are retired educators. Dr. Hayling graduated from Florida A & M College and went on to the Air Force Officer's Candidate School and was commissioned second lieutenant in the United States Air Force having served four years in the Aero Medical Research Center at Wright-Patterson Air Force Base and also in the far east. He entered Meharry Medical College in Nashville, Tennessee. In his book, Living in the Shadows of a Legend, Unsung Heroes & Sheroes Who Marched With Dr. Martin Luther King, Jr., Deric Gilliard describes the college as, "...the only dental school geared towards blacks." In December, 1960, Dr. Hayling earned his degree in Dentistry and began his practice in St. Augustine, Florida. He took over the practice of Dr. Rudolph Gordon who died in 1959 after a car accident and serious health problems. Dr. Gordon was also the husband of St. Johns County Educator, Mrs. Rosalie Gordon. Dr. Hayling is the first Black Dentist, in Florida, to be elected to local, regional, and state components of the American Dental Association. He served as an adult advisor to the NAACP Youth Council and for eleven months as the head of the St. Augustine Chapter of the Southern Christian Leadership Council (SCLC). Dr. Hayling and the Black Community, in St. Augustine, were confronted with many prevailing acts of discrimination. He fought in the Civil Rights Movement alongside such notable Civil Rights Activists as the Reverend Dr. Martin Luther King, Jr. (Nobel Prize Laureate), Reverend Ralph Albernathy (SCLC), Reverend Thomas Wright, the Late Mr. Henry Twine (Former St. Augustine City Commissioner/Vice Mayor, NAACP President & Great Floridian Recipient), his wife Mrs. Katherine 'Kat' Twine (Civil Rights Activist/Recipient of the St. Augustine De' Aviles Award), Reverend Andrew Young (former Mayor of Atlanta, GA & Ambassador to the United Nations, under President Jimmy Carter), Reverend Hosea Williams (Chief Lieutenant of SCLC), Ms. Dorothy Cotton (Director of the Citizenship Educational Program, Highlander School in Tennessee, the base in which the whole civil rights movement was built), Mr. J. T. Johnson (SCLC), Reverend Fred Shuttlesworth (SCLC's Vice-President), the Late Reverend Goldie Eubanks, Reverend C. T. Vivian (SCLC), Mr. Clyde Jenkins, Mr. James Hauser, Mr. James Jackson (Civil Rights Activists), and others to lead non-violent civil rights demonstrations to desegregate St. Augustine's white business establishments who practiced such discriminatory practices as refusing to serve blacks at their lunch counters, restaurants, and hotels. For his continued fight to right the injustices perpetrated upon him and his fellow Black Citizens, his home was shot into, barely missing his wife and killing his dog which was within the home. His wife and children escaped without injury. On another occasion, Dr. Hayling, along with Mr. Clyde Jenkins, Mr. James Hauser, Mr. James Jackson were kidnapped by the Klu Klux Klan. All of the men, except Mr. James Jackson were beaten unmercifully and left semi-conscious. 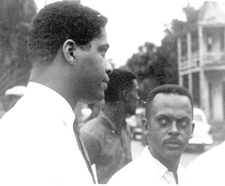 If not for the compassion of a white minister, Reverend Irvin Cheney, who slipped from the rally and called the State Highway Patrol in Tallahassee, Dr. Hayling and his fellow activists, who were stacked like firewood, would have been burned alive with gasoline. Dr. Hayling received the most serious injuries, suffering hospitalization for fourteen days, losing eleven teeth, and several broken ribs. Scars he is known to have said, "I'll take to my grave." He and the others were charged with assault but charges were dropped because the Klan never showed up to court. The Klan was never prosecuted in this case. Recently, in honor of the Late Dr. Marvin Davies, the Florida State Senate, on May 21, 2003, passed the Dr. Marvin Davies Florida Civil Rights Act, which provides the Attorney General with the authority to initiate a civil rights action when a pattern or practice of discrimination has occurred, or where there is an issue of great public interest. 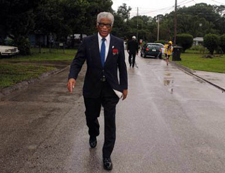 The residents of Rollins Subdivision, Scott Street, Mr. David Nolan (local historian), and the Committee to celebrate the 40th Anniversary of the Civil Rights Demonstrations (ACCORD) requested that the City of St. Augustine rename Scott Street to Dr. Robert B. Hayling Street in honor of this Outstanding and Courageous Man. We do honor and celebrate his perseverance and love for his fellow man. Dr. Hayling has certainly paid his dues and deserves this honor bestowed upon him today. The Late Marvin Davies describes Dr. Hayling as, "The father of the Civil Rights Act of 1964". Gwendolyn Duncan, President of 40th ACCORD, Inc.
— Copyright © 2004,The 40th ACCORD, Inc.